Apple’s Tim Cook believes that AR will be a “big and profound” revolution “that we’ll look back at and marvel on the start of it”. In four years, 3 billion consumers will have access to AR technology through iOS and Android smartphones, so the technology for AR apps is here. How do we build AR that consumers will use? What should an AR app do? What’s AR going to be like in everyday use? 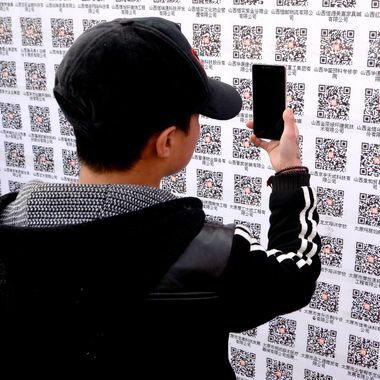 China’s QR revolution is early stage AR. One billion consumers already use QR codes to bridge the physical and digital worlds. QR-AR uses a smartphone’s camera to recognize a local context, present digital information, make decisions, and execute transactions. These are all the steps of AR, save for the lifelike graphical overlays-- which will be coming soon. Better still, China’s QR-AR is everyday AR used in the course of daily life. Users exchange contact information, become friends, learn about a job offer, order food, trace a vegetable’s provenance, register for contests, and donate to charity. QR codes are everywhere. They are printed on paper, tattooed on necks, unfurled on buildings, landscaped from bushes, flashed on TV screens, projected from digital screens large and small, encased in laminate, painted on walls, embedded in stone, and taped to lampposts. The digital world blurs into the physical. A QR code is more than a technical aim point, it’s also a critical physical cue for consumers. It’s a signal that there’s a digital bridge for an object, service, space, or person. With advanced AR, we can move beyond the ugly QR code and use more enticing symbols, graphics, words, or brand logos. But we need that visual cue, especially for early AR apps, for the simple reason that consumers need to recognize when to use this new technology. QR-AR in China indicates that these physical cues should also be tightly linked to the specific object, service, or person where it is displayed. The tighter and deeper the link the better. In China, QR codes in a grocery store lead to specific information about a product, or even to a purchase, not to the store’s web site. It’s better to line up multiple QR codes each tied to a specific action or value proposition, rather than a single QR code leading to many possible actions. QR users must pull information. QR-AR’s rapid acceptance and expansion in China indicates this is a feature of early AR, not a bug. AR apps and glasses that push overlays into a consumer's vision unbidden may suffer backlash, not just against the app but possibly against the platform as well. China’s QR-AR often rewards consumers in the real world with an immediate coupon, discount, free product, sample, or completed transaction. There’s a real world result for the real world action. QR-AR is simply the digital enabler. Everyday AR is a tool, a means to an ends, not an end in itself. It's a digital technology that removes real-world friction and then disappears. WeChat's been very deliberate about this, focusing on utility rather than attention. QR-AR is fast. It's fast not just in technical rendering, but in time to value. It's fast because it must work when a consumer’s time and attention are most valuable. This speed is an outcome of WeChat's focus on utility, and its designers often cite Google’s search service as an example of what they want to achieve. QR-AR is simple. Its lack of lifelike graphical overlays is part of the reason for its success. Because there’s no capacity for over-elaboration, the presentation does not get in the way of the service. Like WeChat, dominant everyday AR apps will align measures of success with the revenue streams of the company's products or services. For Facebook or Snap, attention provides the revenue. For grocery stores, it's selling inventory. For China, the transition from QR codes to more advanced AR experiences will be straightforward simply because one billion consumers are already using their smartphone's cameras to enhance their everyday lives. Although Western consumers aren't there yet, it does suggest that maybe it's time to take another look at how QR codes might help our development and adoption of these exciting AR technologies. But that's for another blog post.